I've been trying to figure out why OCTranspo doesn't offer an off-peak pass. The only thing I've been able to think of as yet is that since they have a cash/pass/ticket based system it would be difficult to do. Any thoughts? I can see that when they eventually move to some sort of card based system for passes/declining balance and do away with cash (I suppose this is harder to do for bus systems, easier to do for subways due to the number of stations/stops) that maybe this would be more realistic. A card system with declining balance might be made better by allowing you to bill fare credit to your cell bill or having vendors sell prepaid cards (like prepaid cell or long distance) to top up your card by way of phone (this requires persistent data connectivity to any reader which would have to be cellular or muni-wifi). As promised, a little more detail on our Inca trail trip. We woke early (5am) on Sunday morning and made final preparations for the day. We were picked up at the B&B we were staying at 6:15am by Olly, our guide. We then picked up three Americans (Maggie, Amy and Matt) before making our way to Ollyantambo to grab some breakfast and our final group member, Steve a Brit at the end of a 10 month around the world trip. From Ollyatambo it was another 45 minutes or so drive to Kilometre 82 (measured as a distance on the railway) where we would embark upon the trail. The beginning of the trail saw us take a group photo under what has got to be a famous Inca Trail sign, and then make our way through the first control point. Our porters also had to make their way through a different checkpoint in order to ensure that they were carrying less than 25 kilos each. We had to check in with our passports and then began our journey by crossing a suspension bridge across the Urubamba river. On the other side of the river Olly told us to pick up little stones that we would leave at the first pass the next day. Meg and I spent the last leg of our Peru trip enjoying the 'middle' coast area. As mentioned in my last post, we made our way to Ica by way of Lima (a flight to Lima and then a 4 hour bus ride rather than our initial thoughts of a 20 hour bus ride). 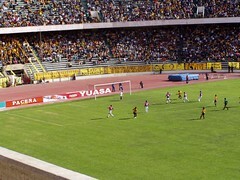 We chose to spend 3 nights in Ica, which we would use as a jumping off point for a day trip to Nazca as well. The most surprising thing to us was the degree to which the area south of Lima (and I would guess that portions of Lima itself) look like a desert, I guess we simply weren't expecting that. We arrived late in the evening in Ica, used an internet cafe to post that last entry and then ate dinner before turning in for the night. 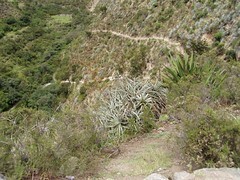 Wow, That´s all I´ve got to say about the Inca Trail. But seriously, Meg and I had a great time on our four day trek of the Inca Trail. We used Q´ente (a group Steve and Jody had used before) and had a great experience. We completed the typical four day trek in three days as our last campsite would have left a near midnight departure for Machu Picchu on the last day. So instead we hustled past Machu Picchu on the third day and camped below the mountain, returning on our fourth day early in the morning (as it opened at 6am). 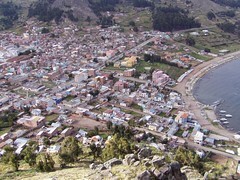 Well, Copacabana was a nice little lakeside town on the shores of Lake Titicaca, the world´s highest navigable lake. We actually had a guided tour of this section of our trip, which was a bit of a treat. We arrived and ate lunch, and then took a boat out to visit Isla del Sol where we did a steep climb up the island, and then a short 30min. walk (rather than the normal 3 hour tour). This island housed some of the first Inca people´s before they relocated to the Cusco area. We made our way back to the village and went for a bit of stroll around the market before leaving our guide and going for dinner at a touristy place - after having lots of Bolivian food Meg had spaghetti with pesto and I had pizza. Meg and I have enjoyed a couple of nice days here in La Paz. Sunday we took things pretty easy, sleeping in a bit before going for lunch at a friend of Meghan's in the city centre. This girl, Linda, has an amazing apartment, with a view that overlooks the city and the tallest snow covered peak in the area, Mt. Illimani. We had a nice lunch and Meg was able to meet some of Linda's other friends from the city.